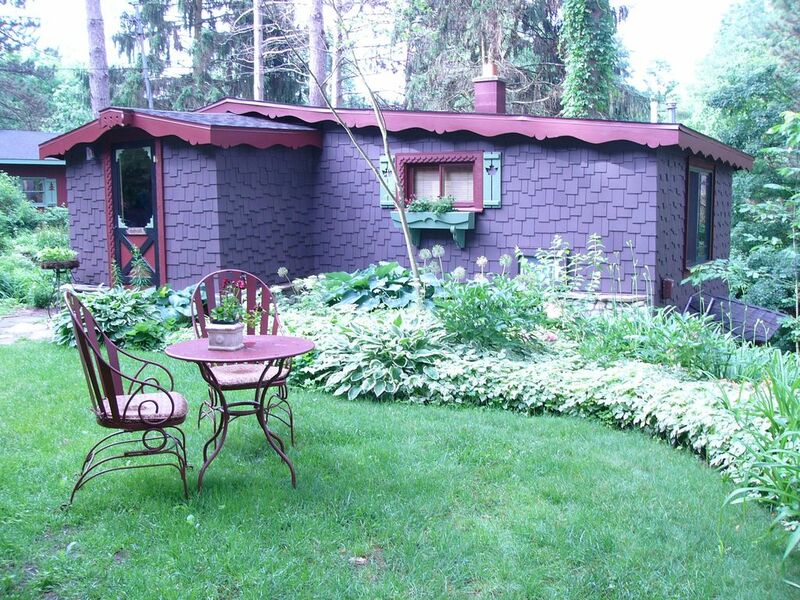 L'esperienza bellezza e il fascino del Northern Michigan presso il "Cottage Garden". Il "Cottage Garden" è immerso tra giardini perenni e pini bianchi torreggianti su Lakeview lago appena fuori dal villaggio di Lake Ann, 15 minuti ad ovest di Traverse City. Godetevi i numerosi giardini perenni mentre si guarda il cervo bianco-coda fermarsi per un drink al puntello o le molte specie di uccelli che hanno fatto le loro case nelle nicchie in tutto il giardino. Lakeview Lake è bella e offre grande pesca tra cui il luccio, persico sole, e basso, per provare la tua abilità di pesca. Il "Cottage Garden" offre una camera da letto, due bagni, un divano-letto nel soggiorno, cucina completa, e lavanderia. La passeggiata-out patio è perfetto per cene romantiche e tramonti spettacolari. We have being staying at the cottage since at least 2004 and this was one of the most memorable and relaxing weeks we've had. . . . . and the fish were biting. Looking forward to our next visit, hopefully this fall. This cottage is everything we want and need for a long weekend getaway. Comfortable, clean and affordable. It’s our fourth time staying here and we will be back. Thank you so much for your kind words! its such a wonderful feeling to share & know that others are enjoying. I appreciate your patronage! This cottage was everything we imagined it to be. The grounds were beautiful, the view incredible, comfortable and cozy. The cottage had kayaks available to use, so we went out on the water and enjoyed an early morning peaceful paddle. You can certainly relax and get recharged in this beautiful setting. First off, can't say enough about the hospitality. We were well taken care of from booking through our actual stay, and the owner is close in proximity yet still positioned us to feel like we had all the privacy desired. The garden is a work of art in itself, and the flowers that had been freshly picked and placed throughout the cottage were an amazing touch. We enjoyed kayaking, fishing was great (caught a number of good sized bass and bluegill), and brought our boat to hit the lakes that are right up the road. The lakeside fire pit made it easy to relax at the waters edge at night. We saw foxes, deer, and lots of different birds. Close enough to traverse city that its convenient, but just far enough outside to where you can really get away. Thanks again for the awesome vacation! Thank you so much for your wonderful review! Thank you especially for mentioning you felt your privacy was honored. We have a lot potential guests concerned about that and it isn't always easy to reassure them. Thank you for doing so. You were an absolute pleasure to have and we hope to see you back again. I am so excited for you that you saw the foxes - not something you see even around here everyday. Very cool. Idyllic and out of a Fairy-Tale. Lots of charm and thought went into every detail (from the fish on the wallpaper to the gardens), and I simply loved it all. I enjoyed the private setting. We were lodged among lakes and trees. First and foremost, this place was perfectly suited for our needs. It is close to the attractions in Traverse City (20 min away), Old Mission Peninsula, and the Sleeping Bear Dunes National Lakeshore, but feels far removed from city life. There is a laundry room in the cottage, and it operates on a trust system. For $1 a wash or dry, we used the washer/drier to launder our bathing suits and beach towels after a day at the beach. That was a major perk for us. We also appreciate the full kitchen. There are plenty of games and puzzles, which our young children enjoyed during the down time. I would definitely stay here again, and lengthen my stay for a full week. This is our first experience with an AIRBNB and I am simply blown away with how smooth the hostess made the process, and how comfortable she made the cottage. Reservations for one night will be incur a $50 surcharge. Pet depsoit is refundable provided no damages incurred.